In the rez of putting on, an entrance, a vast stay-dining room of 80 m2 opening on a shaded pergola, a room + sdb-toilet, a entirely equipped kitchen. On the floor, 5 rooms among which 3 with their room of privatory water, 1 independent shower, 1wc. A last independent room with access from the outside, washbasin. Inès' sought-after decoration combines beautiful Vintage pieces very nicely mixed with furniture, more modern cushions to give a very welcoming spirit, very elegant! The rooms each have a color cast in beautiful tones, 4 of them have a beautiful sea view, the other on the back are in the countryside, very nice! A beautiful swimming pool (11x5) heated, entirely created in 2015 with a beautiful beach to pool all around, surrounded by landscaped garden (security fence on demand). Shower and toilet outside near the pool. Access to the house via a secure gate, parking space for several cars. 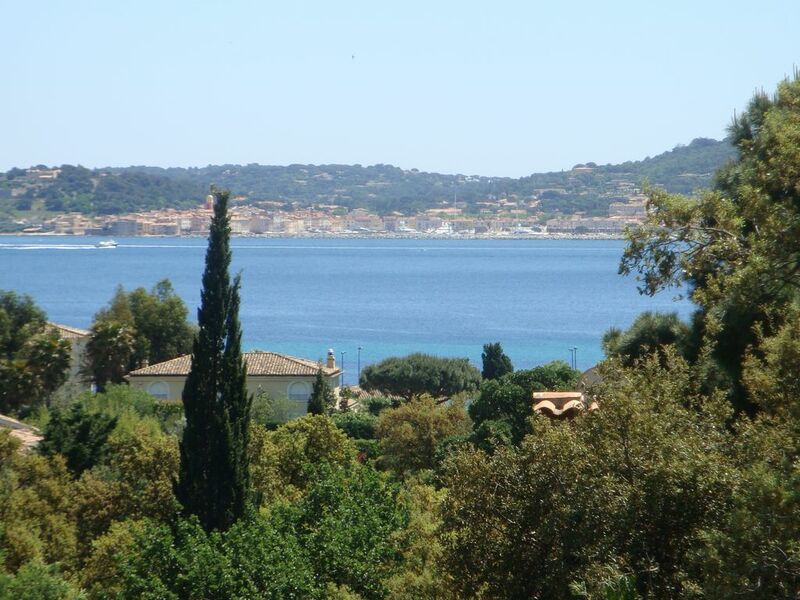 Beautiful sea view on St Tropez. plot of 2,000 m2. Privatized access to the beach of the Nautical Club of Beauvallon (in season, from July to August, windsurfing rentals, paddles, dinghies, hobbycats and sailing lessons by qualified instructors). For golfers, the beautiful course of Beauvallon is a 5 minute drive, and a tennis club. Wonderful, old house from 1920 with a great view on the bay. The Kids enjoyed the big pool and the large house. The house is excellent equiped with all the needs for wonderful Holidays. List of activities and contacts available on request.